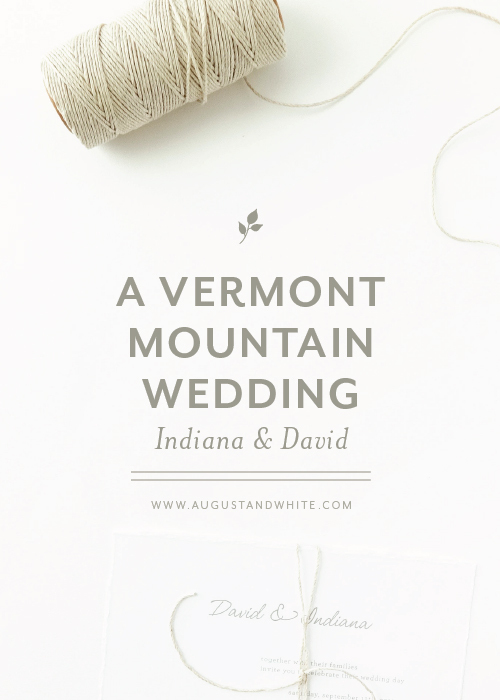 When initially discussing the invitations, Indy loved the look of our Mountain graphic; however, this closely resembled mountains out west, not on the east coast. I was able to modify the graphic to have more of a rolling hills effect to match her location, and implemented this utilizing the unique staggered layout of our Isabella Suite. To continue with the minimalist theme, we kept the colors a medium grey and a soft, muted green which fit her overall color palette. Once seeing a sample, Indy had decided to go with the hand torn edging as well as muted green envelope liners to compliment the overall rustic aesthetic. While she didn't use traditional reply cards, her reply insert card kept the staggered layout and featured the custom mountain graphic on the top. For her wedding day stationery, we continued the design to menus, itineraries, table numbers and thank you cards. I think these may be my favorite menus that I have designed to date, as we implemented icons for food, as well as emphasized that all of the food was from local farms. In addition, we created these gorgeous wedding weekend timelines, to inform their guests of the great activities they had planned. The wedding stationery complimented her gorgeous flowers, linen tablecloths and the pops of green perfectly.